Raviolis are extremely versatile as you can use almost any filling inside. We add a stroke of genius in the pasta dough of this recipe: Knorr Chicken Seasoning powder. 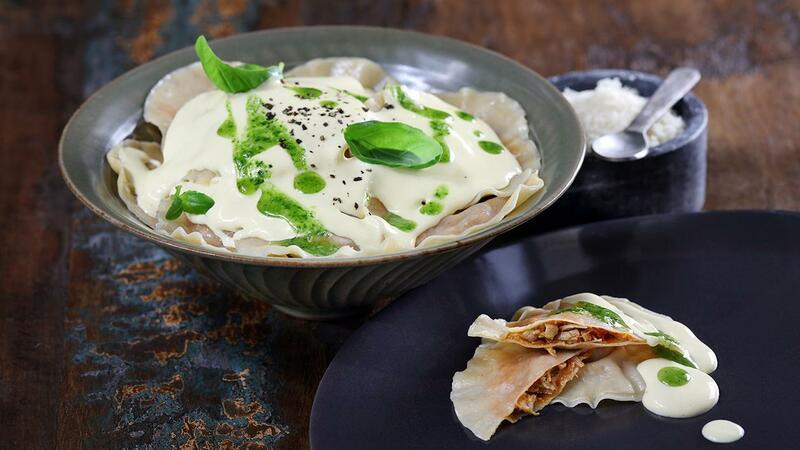 The raviolis have a chicken curry filling accentuated by the chicken flavoured pasta dough, contrasting well with a creamy Cheese-like sauce made with Knorr Soup Base Mix and coriander pesto. Marinate the chicken with garlic, ginger, Thai red curry paste and Corn Oil minimum 4 hours. Once curry is cooked finish off with Knorr Chicken Seasoning Powder and chill down. Shred the chicken into small pieces. Form a well and place the eggs, oil and Knorr Chicken Seasoning Powder in the centre. by hand mix the wet and dry ingredients until a firm dough is formed. Knee the dough until smooth and shiny. Rest in chiller for 30 minutes. Roll out the pasta sheets, add the chicken curry filling. Cut and shape your ravioli’s to the desired size and shape. Garnish with Coriander Pesto and Parmesan Cheese. Boil and simmer the quick cheese sauce while boosting the chicken aroma with Knorr Chicken Seasoning Powder. Blanche the ravioli’s and cover with sauce, drizzle coriander pesto and serve with grated parmesan cheese.